Welcome to the Elms and Farm View - two cosy and comfortable holiday apartments within the beautifully restored Old Rectory Coach House. We are ideally situated in the heart of Sampford Brett - a quintessential English village with a stream meandering besides the road. 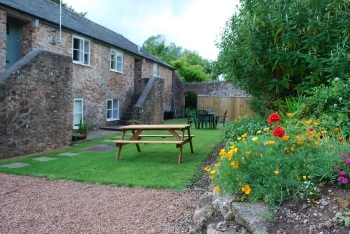 It is an excellent base for exploring Exmoor and the Quantock Hills and is within 2 miles of the coast and ancient port of Watchet. Our accommodation is ideal for families, walkers and cyclists. It provides very easy access to an extensive network of footpaths and bridleways. There are superb walks and bike rides straight from the gate and we have a large garden and swimming pool for you to relax in on your return. Drying room and cycle storage facilities are available and we offer daily transport to/from the Coleridge Way for those looking to walk this fabulous route. There is also a trampoline, climbing frame, swings and a slide to keep younger family members entertained. Both properties sleep 4 and are equipped to a very high standard. Farm View has one large double bedroom and one twin room with bunks (and a sofa bed in the lounge) whereas The Elms has two double bedrooms. Both properties are equipped to a very high standard and our tariffs are inclusive of central heating, plentiful hot water, bed-linen, fluffy towels and WiFi. Pets and children are welcome and we offer short breaks throughout the year.